The boys reached 5 months old this week and they are changing so fast. Both boys rolled from their backs to their stomachs this month. Ruslan cries when he realizes what has happened; Wyatt will keep rolling. If we leave them on the floor to play, they are still in the same general area when we get back but they are squirming their way around the floor – rolling and spinning and sliding. They are playing with toys more and more – pulling on hanging toys, waving them around, squirming to reach something they want, and chewing on everything once it is in their hands. We recently switched one of Ruslan’s daytime bottles to half formula as we start to slowly transition to all formula over the next few months. His reflux is definitely doing better, but we we are seeing an increase in spit-up after that bottle. We are hoping that the 6-month mark will be magical and the reflux will vanish. 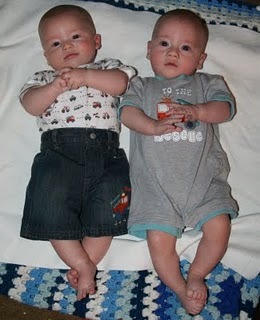 We made the change to 6-9 months size sleepers, and Ruslan is wearing the summer clothes that I we have in that size. The remainder of their clothing is still 6 month, but we will soon be packing up the summer clothes and washing all of the 9 month fall clothes. These boys generate so much laundry – I have to do their wash every other day to keep up with the overflowing hamper. Plus when Ruslan has a few bad reflux days, we go through bibs in a hurry. We are waiting until closer to 6 months to introduce solid foods. They are showing all of the readiness signs, but we don’t want to rush it. With the sensitivity Ruslan has had to any dairy I ingest, there is some concern that he may have a tendency toward food allergies. 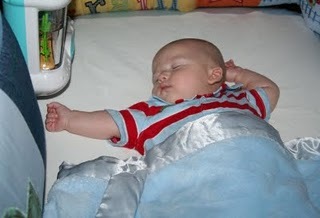 Wyatt sleeps on his left side with his left arm cupped around his head. And all night long he spins around in his crib. Ruslan is always in the exact same spot where we left him the night before, flat on his back. His arms are either both stretched straight out to the sides, overhead or tucked up beneath his head.